The Barisieur can deliver a decent cup of coffee, but you’ll have to get out of bed to help prepare it. (Photo by Stacy Zarin Goldberg for The Washington Post). The first four times that friends posted the Barisieur on my Facebook wall, I didn’t even bother clicking on the link. I figured it was a joke, like a high-tech version of the Bathe & Brew (“Cleanup is a breeze! Just spray down your Bathe & Brew with your usual shower cleaner!”). But recently, I learned that the Barisieur is as real as a bleating alarm at 6 a.m. It’s now available in the United States for folks who want a cup of joe to accompany their sleepy morning strolls across their smartphones. 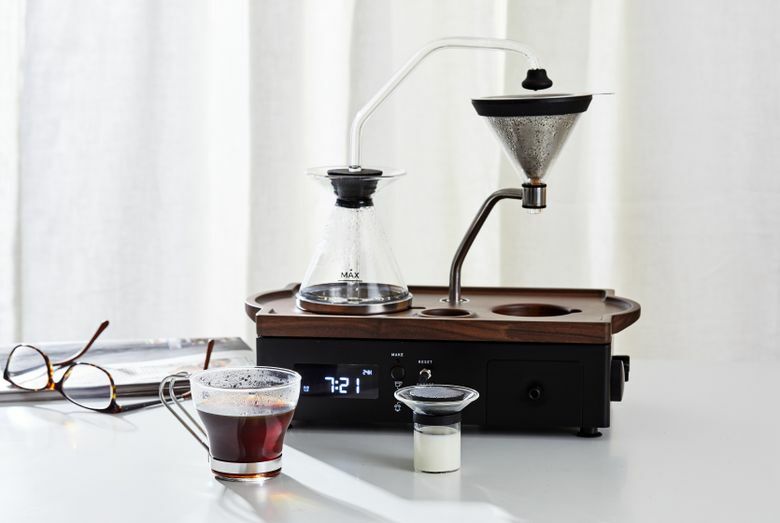 It’s available, I should say, for those with the discretionary income to shell out $445 for a bedside coffee maker that will wake you first with an alarm and then, a few minutes later, with caffeine. No one really needs this machine, yet its popularity suggests otherwise. The Barisieur has already sold thousands of units since hitting the British market in May and the U.S. market in November. What’s the draw? I’d suggest the machine offers a form of pampering without the need for human contact, the perfect brewing device for a species that increasingly interacts with its own kind only through gadgetry. The Barisieur extends the promise of coffee in bed without the warmth of a partner to prepare and serve the cup to you. It’s one more way that technology wedges itself into the spaces where person-to-person intimacy used to exist. But the Barisieur, I think, also extends the promise of third-wave coffee — the first wave was commodity mud like Folgers, the second was Starbucks and the third is the lumberjack set that sneers at the first two waves over its Japanese brewers — without the fuss of preparing your own pour-over. I contacted Barisieur founder Joshua Renouf, an affable Brit who quickly let me know he’s not a third-wave geek. He’s a designer who was dragged into the specialty-coffee world when he developed a prototype of the Barisieur as his final project at Nottingham Trent University, where he studied product design. He took his inspiration from the resurgence of vinyl records, not coffee. As Renouf suggests, there is a DIY element to the Barisieur, but nothing more than your standard drip coffee maker from Target. You have to fill a water beaker and prepare the beans. I won’t bore you with all the mind-numbing details of my tests. Instead, I’ll skip straight to the bottom line: You can enjoy a decent automated pour-over coffee on the Barisieur, but it will require more effort than perhaps you expected. You may even need to get out of bed. Before I get into the particulars, I should point out that the Barisieur is beautifully designed, a sleek steampunk mash-up of vintage stereo gear, ’70s-era alarm clocks, moonshine stills and Japanese third-wave gadgetry. It’s an art installation for your bedroom, though not one you’ll probably show off to guests, unless you frequently invite company into your bedroom and/or live in a studio apartment. The drawbacks to the Barisieur are apparent to anyone familiar with specialty coffee. No one — I repeat, no one — who loves good coffee will grind their beans and dump the grounds into the metal filter before bed time. Those grounds will oxidize overnight, losing many of their hard-earned flavors in the process. The cups that I sampled from beans ground the night before resulted in thin, stale and cardboardy coffee, even when I used freshly roasted beans. Each cup was also small in volume, between four and five ounces, a caffeine tease. What’s more, the glass spout on the Barisieur releases a single stream of water, which means the grounds directly underneath the waterfall will be over-extracted while those along the side will be under-extracted. (Free advice for the 2.0 model: Add a spray nozzle, assuming the water pressure is high enough to accommodate one.) Finally, no matter how fine you grind the beans, the coffee will not steep long enough to extract all the desired flavors. In the end, you’ll have a coffee that’s closer in body to that of tea, which is actually how some drinkers prefer their morning jolt. I fondly recall the tealike coffee that I was handed at the Coffee Collective in Copenhagen. Yet: As much as I admired the porcelain fragility of that coffee, both delicate and fruity, I knew there were more flavors still trapped in the grounds. These deviations will, by their very active nature, deprive you of the bougie meditative quality of waking up to coffee already prepared. Renouf hints that the next iteration of the Barisieur may be designed more for the kitchen than the bedroom, essentially abandoning the promise of bedside coffee as you knock the sleep from your eyes. It’s probably for the best. You can, of course, just go ahead and grind the beans before bed, the quality of your morning cup be damned. But then you’ll be that rarest of coffee drinkers: Someone with third-wave aspirations — and a first-wave palate.